In this blogpost I’m going into detail about the birth of my son, it is a really personal story. It all started with an appointment at the hospital at 38 weeks. They wanted to induce the childbirth, because of the estimated low weight of my baby. We had to be there at 8:30 am on sunday and they put me in a room with 3 other women. I had to wait a while before they could make a chart of the heartbeat of my baby, because they were short on those machines. When that was done, they brought me to a seperate room, where they checked if I had enough disclosure. It was only 1cm disclosure and they placed a little balloon to help the disclosure. The balloon had to stay there for 24 hours or until it fell out before than. So as the day went on, they made more charts of the heartbeat and I got some menstruation like cramps. The other 3 women went into labour that day, my boyfriend went home and I was alone in the room for the night. The next day I woke up early, because I don’t sleep well if I’m not in my own bed. They made another chart of the heartbeat and 2 other women were assigned to the room. Than I had to wait untill my boyfriend could be there and for the doctors. My boyfriend came 5 minutes before the doctors came to check up. We had to go to that same little room as the day before and they removed the balloon. When they checked the disclosure it was at 3cm, so it was time to go to the delivery rooms. They broke my membranes at 10:30 am, after that they gave me some medicine through an IV to induce contractions and every 2 hours a little bit more. For the contractions felt heavier than my menstrual pain, but I could handle it. The worst pain was when I got the contractions to push, I had that pain for 30-60 minutes. After that they checked the disclosure and it was 10cm and I was allowed to push. I was shocked when I felt a needle down there to numb it for a small cut, because it was just a bit to tight. They said that it took about 60-90 minutes to actually push until my baby by boy was born at 18:56 pm. 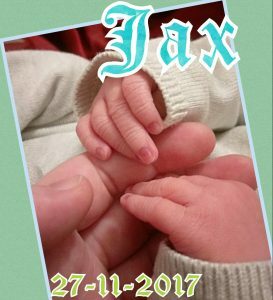 Jax was born on 27 november 2017. After the birth they laid him down on my chest and I just cuddled him for an hour, while an intern stitched the cut. Then they checked if everything was good with Jax, I got something to eat and then I was allowed to take a shower. Jax and I had to stay the night, because he was just 25grams to light and had to be checked every three hours. Most of the actual birth was told to me, because I was to distracted with the contractons and pushing. Now he is already 2 months old, he looks a lot like his dad and I feel like I’ve known Jax my whole life. And he is definitely getting a little brother or sister in the future. My tips for every pregnant women. Do not plan the childbirth, because nothing will go as planned. I just trusted my own intuition and listened to the advice of the doctors/nurses.